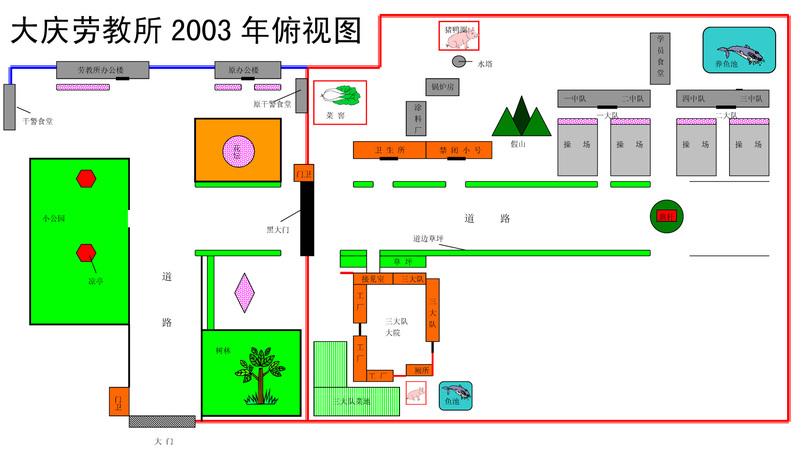 (Clearwisdom.net) To assist the Coalition to Investigate the Persecution (CIPFG) in their work investigating forced labor camps, prisons and other places, here we drafted an aerial map of Daqing Forced Labor Camp in 2003. We would also like to ask people who know it to revise it if you find anything inaccurate. Each team or sub-team of Daqing Forced Labor Camp has held practitioners. After the exposure of the Sujiatun incident, all the practitioners were transferred to Shuihua Forced Labor Camp. Wang Bin, computer engineer of Daqing Institute of Oil Exploration and Development and a second prize winner of a national science award, was savagely beaten to death by policeman Feng Xi of the Daqing Labor Camp on September 24, 2000. His body, after the organs including the heart and brain were excised, was placed in the morgue of the Daqing People's Hospital.